This is a first. Usually when we go into these performance previews we’re aware of the architecture we’re reviewing, all we’re missing are the intimate details of how well it performs. This was the case for Conroe, Nehalem and Lynnfield (we sat Westmere out until final hardware was ready). Sandy Bridge, is a different story entirely. 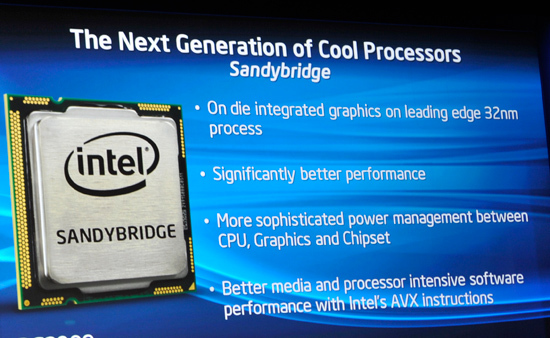 Sandy Bridge is a 32nm CPU with an on-die GPU. While Clarkdale/Arrandale have a 45nm GPU on package, Sandy Bridge moves the GPU transistors on die. Not only is the GPU on die but it shares the L3 cache of the CPU. There are two different GPU configurations, referred to internally as 1 core or 2 cores. A single GPU core in this case refers to 6 EUs, Intel’s graphics processor equivalent (NVIDIA would call them CUDA cores). Sandy Bridge will be offered in configurations with 6 or 12 EUs. While the numbers may not sound like much, the Sandy Bridge GPU is significantly redesigned compared to what’s out currently. Intel already announced a ~2x performance improvement compared to Clarkdale/Arrandale, and I can say that after testing Sandy Bridge Intel has been able to achieve at least that. Both the CPU and GPU on SB will be able to turbo independently of one another. If you’re playing a game that uses more GPU than CPU, the CPU may run at stock speed (or lower) and the GPU can use the additional thermal headroom to clock up. The same applies in reverse if you’re running something computationally intensive. On the CPU side little is known about the execution pipeline. Sandy Bridge enables support for AVX instructions, just like Bulldozer. The CPU will also have dedicated hardware video transcoding hardware to fend off advances by GPUs in the transcoding space. Caches remain mostly unchanged. The L1 cache is still 64KB (32KB instruction + 32KB data) and the L2 is still a low latency 256KB. I measured both as still 4 and 10 cycles respectively. The L3 cache has changed however. The other change appears to either be L3 cache latency or prefetcher aggressiveness, or both. Although most third party tools don’t accurately measure L3 latency they can usually give you a rough idea of latency changes between similar architectures. In this case I turned to cachemem which reported Sandy Bridge’s L3 latency as 26 cycles, down from ~35 in Lynnfield (Lynnfield’s actual L3 latency is 42 clocks). As I mentioned before, I’m not sure whether this is the result of a lower latency L3 cache or more aggressive prefetchers, or both. I had limited time with the system and was unfortunately unable to do much more. And that’s about it. I can fit everything I know about Sandy Bridge onto a single page and even then it’s not telling us much. We’ll certainly find out more at IDF next month. What I will say is this: Sandy Bridge is not a minor update. As you’ll soon see, the performance improvements the CPU will offer across the board will make most anyone want to upgrade.